On July 20, the Department of Tourism held a training conference on state management of tourism and built decentralization project for localities. More than 120 representatives are cadres of commune, ward, culture and information officers of districts, towns and cities in the province. Representatives have been disseminated and guided the state management of business related to tourism such as accommodation, tourism services (food, entertainment, sports, shopping, health care, etc. ), travel services. In addition, representatives of the Department of Tourism also presented the direction of decentralization of management of the Department for tourism; popularizing and guiding the post-inspection work of tourism business activities in localities; coordinating the implementation of the inspection and check for tourism enterprises in the project on decentralization of management of tourism activities. The People's Committee of KhanhHoa province has issued a decision approving the plan for controlling and protecting tourism resources in association with environmental protection (EP) and responding to climate change impacts on tourism development. Accordingly, by 2020 and 2030, organizations and individuals that manage and exploit tourism (sites, monuments and accommodation establishments) must fully comply with environmental protection requirements as prescribed, over 90% and 100% of establishments namely are approved by environmental authorities; over 90% and 100% of facilities arranged reasonable installation of sanitation, garbage collection; 100% of establishments allocating human resources for environmental sanitation in accordance with their business activities; 90% and 100% of managers in tourism, community and tourists are propagated on environmental protection law. Recently, Cam Ranh international terminal (Cam Ranh International Airport) has officially operated and picked up the first flight. It is Vietnam Airlines VN719 flight from Chengdu (China) to Cam Ranh new international terminal. Passengers have experiences of services and infrastructure of the new 4-star international terminal. The transfer of all international flight operations to the new terminal will enhance the capacity of service on ground, providing the synchronization between services and high-quality infrastructure, contributing to rendering best services for passengers. According to a report of the Tourism Department, recently, activities of travel service business in the province have been extremely dynamic. 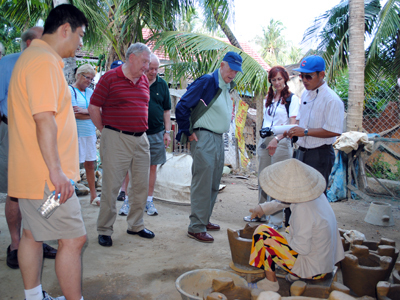 These days, there are 120 tour operators in the province. Accordingly, there are 54 international tour operators, 14 branches, 2 representative offices and 50 domestic tour operators. The Tourist Department has issued 1013 tourist guide ID cards, including 383 domestic tour guides, 630 international tour guides (311 Chinese tour guides, 210 English tour guides, 90 tour guides in Russian, 10 French tour guides, 5 German tour guides, 3 Japanese tour guides and 1 Korean tour guides). Apart from that, the department has withdrawn two tour guide ID cards because of the use of fake degrees to make card-granting records so far.